Extraordinary sophomore release from Scottish pop sensations Strawberry Whiplash! Following a swell of positive feedback for their debut single ‘Who’s In Your Dreams’ last year, the duo deliver four smash hits that unequivocally disqualify them from one hit wonder status forever. Lead track ‘Picture Perfect’ is a shimmering song that sets Sandra's pitch perfect vocals and Laz' chiming and fuzzy guitars to a hip-shaking primitive beat. A flawless slice of pop reminiscent of classic indie singles from The Primitives or Darling Buds, it’s a catchy burst of summertime neatly packaged for any time of the year. ‘Hay In A Needlestack’ is a reflective number featuring mellowed out tremolo guitar and glockenspiel, while ‘Celestial’ is Strawberry Alarm Clock meets The Popguns—jangling guitars leading to fuzzy stop-start choruses and sweet Doorsian organ bursts—and ‘Falling Through’ is a fuzzed up indie pop gem that ticks all the Strawberry Whiplash boxes to conclude the EP. 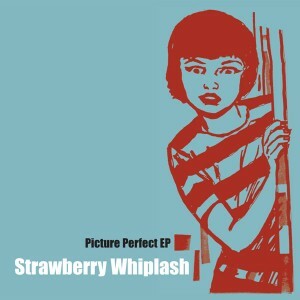 Four fantastic songs that prove the brilliance of the band’s debut single was no happy accident, ‘Picture Perfect’ is an absolute triumph for Strawberry Whiplash and another notable release for Matinée. Limited to 1000 copies in custom minijacket.